The Research Excellence Framework (REF) is a method of how the UK Government assesses Reserach Excellence and this dictates how it gives £2 billion a year to Higher Education Centres. This occurs every 5-6 years and the next one in in 2020/2021. This process costs hundreds of millions of Pounds. But we all know Cambridge will come top and the top 5 can be predicted. This created a culture of bullying in some places and there was a case last time when a person sent out a global email complaining of the bullying threat of sacking and stress that the reseach had been put under…to which you thought they are going to get sacked…only to find out that this was a timed launch and the person had commtted suicide two weeks before. It also created a transfer market were salararies and lab funds could be boosted by the cost of poaching,or stopping poaching to keep staff, so that places can boost their ranking and hnce cash. The rules have been changing each year so what’s in store for REF 2020/2021. Well we had some in sight this week with the publication of the Lord Stern Report . President of the British Academy Lord Nicholas Stern was commissioned by the government to carry out the review of the Research Excellence Framework (REF) to ensure future university research funding is allocated more efficiently, offers greater rewards for excellent research and reduces the administrative burden on institutions. to submit more and others less than the average. So work done in one place can’t be used to support the rankings in another place so now the transfer window is closed. This means no University is going to buy in a mega MS Research lab and give them losts of cash just before the next ref, they are not going to coax in some Foreign MS Research Lab to take their past track record. Now it is going to be based on future potential not past glory. So the transfer market would swtich not to the end of the REF cycle but to the beginning, with the risk of underperformance if the facilities needed are not in place. You always have downtime with a move. Let’s see what gets adopted, but the Head Honchos will be thinking how to maximize their output. However some of the moves like stopping the outputs being portable should have been implemented many years ago, but if it had, TeamG would not be at Barts one suspects ,as we moved in the transfer window. You said in Recommendation 1 that those underperforming in research will become treachers (that is traitors or treacherous persons). Presumably just a Freudian slip? MD, REF exercise favours the bold. 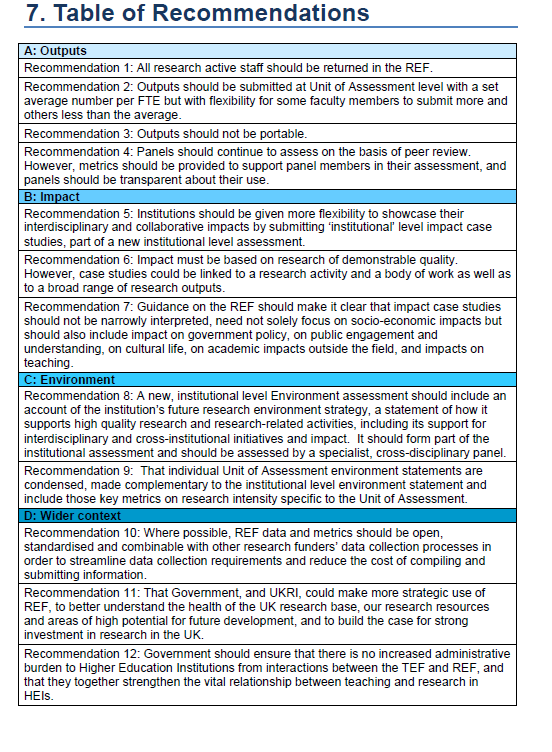 But methinks the current recommendations are sensible in light of all that has happened. I don't think it will prevent poaching though. ClinicSpeak: what matters to you?